Here is the photo of Cynthia Oates that will go on the Howard High School’s Wall of Fame in Wilmington, Delaware. Cynthia is being honored for many accomplishments. For 30 years she taught elementary school children, first in Wilmington and then, after desegregation in 1975, in the Red Clay School District, where she also served as a Student Relations Specialist. 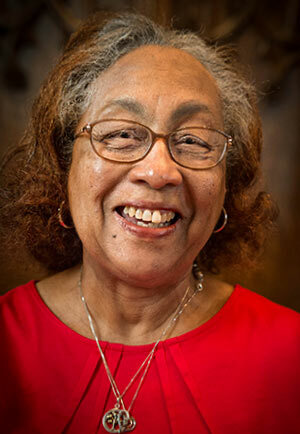 Cynthia also served for 13 years on the board of the Christina School District, helping set education policy. She also has served on the boards of many social service agencies including the first Wilmington River Front Development board and on the Foster Care Review Board. One of the most frequent questions I am asked is, “What focal length should I use for portraits?” I usually answer “50mm for Crop Sensor cameras, 75mm for Full-Frame Sensor cameras.” This is for a typical head shot. The homework assignment I give my students at the Delaware Art Museum is to take portraits at different focal lengths and decide for themselves which focal length is best. Essential to this assignment is to make each photo look like the others. You might include the full head and part of the shoulders in each shot. You might include the head and the entire upper torso. Try to make each photo look the same as the others. If you have an 18-55mm zoom lens, take three portraits at 18, 36, and 55mm. Move close for the 18mm shot, back away for the 36mm shot, and move even further away for the 55mm shot. If you make the subject the same size in each shot, you will notice the background changes a lot, especially if the background is some distance behind the subject. If you have access to a longer focal-length lens, up to 300mm or longer, try those as well. You will have to get even further away from the subject! Here are links to Time Magazine and The Guardian’s best portraits of 2016. If you see one you like, try to imitate it. If you want to imitate one of the best, here is a link to Annie Leibovitz’s 20 best celebrity portraits. Get a make-up artist, hair stylist, costume designer, art director, lighting specialist, etc. She does not always use all those helpers, but you can tell when she does. Click here to see all Danny’s posts about Taking Better Photos.